Nicholas completely lacked his brother's spiritual and intellectual breadth; he saw his role simply as one paternal autocrat ruling his people by whatever means were necessary. Having experienced the trauma of the Decembrist Revolt, Nicholas I was determined to restrain Russian society. A secret police, the so-called Third Section, ran a huge network of spies and informers. The government exercised censorship and other controls over education, publishing, and all manifestations of public life. In 1833 the minister of education, Sergey Uvarov, devised a program of "autocracy, Orthodoxy, and nationality" as the guiding principle of the regime. The people were to show loyalty to the unlimited authority of the tsar, to the traditions of the Orthodox Church, and, in a vague way, to the Russian nation. These principles did not gain the support of the population but instead led to repression in general and to suppression of non-Russian nationalities and religions in particular. For example, the government suppressed the Uniate Church in Ukraine and Belorussia in 1839. Nicholas I was a blunt soldier incapable of comprehending his brother's sentimental sympathy with liberalism. The Decembrists' abortive attempt at revolution and the Polish insurrection of 1831, which he crushed with great severity, confirmed him in his conviction that Russia must be ruled with a strong hand. That conviction he put into practice with extreme rigor during the thirty years of his reign (1825-55), endeavoring by every means at his disposal to prevent revolutionary ideas from germinating spontaneously among his subjects and from being imported from abroad. For this purpose he created a very severe press-censorship and an expensive system of passports, which made it more difficult for Russians to visit foreign countries. It would be unjust, however, to say that he was the determined enemy of all progress. Progress was to be made in certain directions and in a certain way. Not only was the army to be well drilled and the fleet to be carefully equipped; but railways were to be constructed, river-navigation was to be facilitated, manufacturing industry was to be developed, commerce was to be encouraged, the administration was to be improved, the laws were to be codified and the tribunals were to be reorganized. All this was to be done, however, under the strict supervision and guidance of the autocratic power, with as little aid as possible from private initiative and with no control whatever of public opinion, because influential public opinion was apt to produce insubordination. When the results proved unsatisfactory, remedies were sought in increased administrative supervision, draconian legislation and severe punishment, and no attempt was made to get out of the vicious circle. The official emphasis on Russian nationalism contributed to a debate on Russia's place in the world, the meaning of Russian history, and the future of Russia. One group, the Westernizers, believed that Russia remained backward and primitive and could progress only through more thorough Europeanization. Another group, the Slavophiles, idealized the Russia that had existed before Peter the Great. The Slavophiles viewed old Russia as a source of wholeness and looked askance at Western rationalism and materialism. Some of them believed that the Russian peasant commune, or mir, offered an attractive alternative to Western capitalism and could make Russia a potential social and moral savior. The Slavophiles, therefore, represented a form of Russian messianism. Despite the repressions of this period, Russia experienced a flowering of literature and the arts. Through the works of Aleksandr Pushkin, Nikolay Gogol', Ivan Turgenev, and numerous others, Russian literature gained international stature and recognition. Ballet took root in Russia after its importation from France, and classical music became firmly established with the compositions of Mikhail Glinka (1804-57). Internally, Russia's population had grown more diverse with each territorial acquisition. The population included Lutheran Finns, Baltic Germans, Estonians, and some Latvians; Roman Catholic Lithuanians, Poles, and some Latvians; Orthodox and Uniate Belorussians and Ukrainians; Muslim peoples along the empire's southern border; Orthodox Greeks and Georgians; and members of the Armenian Apostolic Church. As Western influence and opposition to Russian autocracy mounted, the regime reacted by creating a secret police and increasing censorship in order to curtail the activities of persons advocating change. The regime remained committed to its serf-based economy as the means of supporting the upper classes, the government, and the military forces. The reign of Nicholas extended to thirty years; at the end of which period, the Czar died, broken-hearted at the failure of all his attempts to subdue Turkey, or to vanquish the allies of a state which Nicholas thought he held at his mercy. 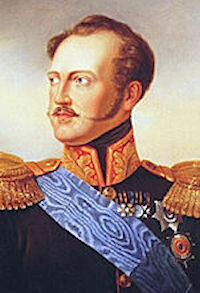 Nicholas I died before the fall of Sevastopol', but he already had recognized the failure of his regime. Russia now faced the choice of initiating major reforms or losing its status as a major European power. In the last months of his life, under the influence of a great national disaster, the conscientious, persistent autocrat began to suspect that his system was a mistake, but he still clung to it obstinately. "My successor," he is reported to have said on his death-bed, "may do as he pleases, but I cannot change!"